IQ Option was an operation which burst right to the top of the binary option popularity charts, as soon as it was launched in 2014. It accomplished great success in a remarkably short time, by delivering the most accessible and attractive deals the industry had to offer. 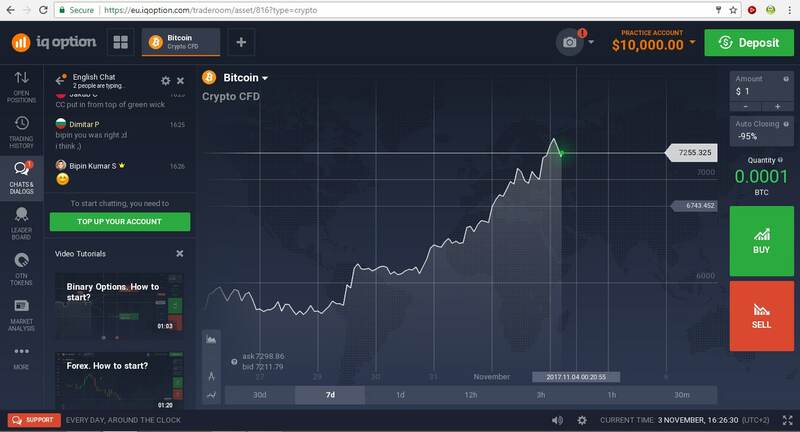 Even as other brokerages were requesting their traders to cough up $200-$500 in minimum required deposits, IQ Option were granting them access to a superb trading platform and an attractive asset selection, for the ridiculous minimum of $10. The returns on the options were good too, and for a while, the brokerage featured a bot builder, which allowed users to create their own automated traders, more or less in the vein of MT4’s Expert Advisors. These bots could then be traded, raced and monetized in various ways. While this feature no longer exists, and while since then, IQ Option have moved on to new pastures product selection-wise, they have retained their excellent trading conditions. That explains why their growth has continued unabated through the last couple of years. In 2014, the operation had 950,000 accounts. By 2016, that number had climbed to more than 14 million, and since then, scores of new accounts were probably added. From a rather “unimpressive” $500,000 in 2014, IQ Option clients are now withdrawing more than 5.7 million every month. Withdrawal processing times and support times have significantly diminished as well. As said above, the most significant changes in the fabric of IQ Option’s offer, came about in the financial product selection. Once focused exclusively on binary options, the operator now offers ETFs, CFDs, Cryptocurrencies as well as straight-up Forex trading. The tradable asset selection is decent within all those categories and the spreads featured are just superb in some instances. The Forex section is what the site seems primarily focused on these days. It features 22 currency pairs, from the EUR/USD pair, all the way to more exotic ones, like the CAD/JPY. The spreads – though variable – are simply amazing. On the EUR/USD for instance, they are in the 0.10% range, though there are much smaller spreads available as well. 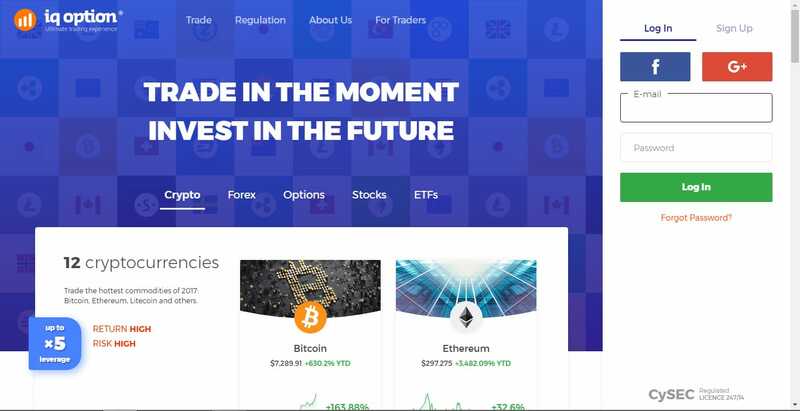 The Cryptocurrency section is essentially one based on the trading of crypto-based CFDs. What this means is that those trading the cryptos will never actually get to possess any. CFDs are contracts for difference and they are based on the price-variations of the underlying asset. No fewer than 13 cryptocurrencies are supported here, from the most prominent, all the way to lower-rung currencies such as Dash, IOTA and Omisego. All the pairs featured in this section are crypto/USD ones. Those looking to trade CFDs based on crypto/crypto pairs, will be able to do so in the CFD section. This is where pairs like LTC/BTC and ETH/BTC are offered, and the spreads are surprisingly attractive here too. Despite having moved away from their initial focus on binary/digital options, IQ Option still have this category covered. The options selection varies depending on the time of the day. Sometimes there are just 22 tradable assets, other times, there are more than 40. These options are said to offer returns of up to 95%, though in practice, these returns are closer to 90%. Traders looking for bigger returns will like the Digital Options, the returns on which can be as high as 900%. The risks associated with such options are higher as well though. IQ Option possess license #247/14, from the Cyprus Securities and Exchange Commission (CySEC). What this license means is that the operation is MiFID-compliant and thus, it can offer financial services all over the EEA (European Economic Area). In addition to CySEC regulation, IQ Option are also registered with a number of national regulatory agencies, such as Germany’s BaFIN, Britain’s FCA and Italy’s Consob. The brokerage does not possess a US license, therefore it cannot offer financial services to US residents in any shape or form. IQ Option’s trading platform used to be one of the best in the binary option industry. It was a sort of big fish in a little pond, and while it has retained all of its useful features, and more have been added, these days it is no longer an industry-leader in this regard. Its technical analysis-focused features are decent, but they are nowhere near the degree of complexity industry leaders, such as MT4, can deliver in this regard. What exactly do you get at IQ Option technical analysis-wise? Charting is where technical analysis begins, and in this regard, IQ Option do indeed have most of the bases covered. Time frames can be changed at the click of a button, from 30 minutes all the way to 30 days. It wouldn’t hurt to have some smaller time frames available as well though. Traders can switch among no fewer than 4 chart types: Area – which seems to be the default option, line, candles and bars. For the spotting of various candlestick patterns, you will find the candle-chart the most useful, obviously. No technical analysis suite would amount to anything without a proper set of graphical tools. At IQ Option, traders will be able to trace lines, trend lines, horizontal lines and Fibonacci lines. The heart and soul of every technical analysis-suite is its selection of technical indicators. At IQ Option, 12 such indicators are included in the package, and no, traders cannot install new ones. This selection covers the MACD, the MA, the Bollinger Bands, the Stochastic Oscillator and others. Adding and removing various tradable assets is as easy as clicking a button too. No fewer than 9 real-time charts can be displayed at the same time. Trading is available directly off the charts. The Open Positions section lets the trader track his/her trades in real time, while the Trading History section can prove useful for analyzing and learning from one’s past mistakes/successful trades. The Chats and Dialogs section is an essential part of the platform. This is the module responsible for the social aspect of the brokerage. This is where traders exchange tips and trading signals. Indeed, sometimes, this section can take on the appearance of a virtual trading floor. It has to be noted that to keep the chat clean and spam-free, IQ Option have only made it available to their real money clients. The Market Analysis section is a sort of Economic Calendar, which is indeed a must for everyone looking to trade the fundamentals one way or the other. Technical analysis in and of itself never provides a full picture in regards to trading opportunities. This section allows traders to weave the fundamentals into the technical aspects seamlessly. IQ Option have decided to get more deeply involved in the cryptocurrency industry, by handing out their own tokens. OTN tokens are given to traders who make at least one commission-based trade per month at the site. The more trades one makes, the more OTN tokens he/she will receive. What gives these tokens value? They can be used to reduce spread and further improve trading conditions. Thus far, almost 1.8 million such tokens have been distributed.